EIL Recruitment 2019 – Apply Online 30 Executive Vacancies| Last Date:16/04/2019. - Sarkarinewjob.com A ultimate job portal to provide employment news. Home Government Jobs Technical Jobs EIL Recruitment 2019 – Apply Online 30 Executive Vacancies| Last Date:16/04/2019. 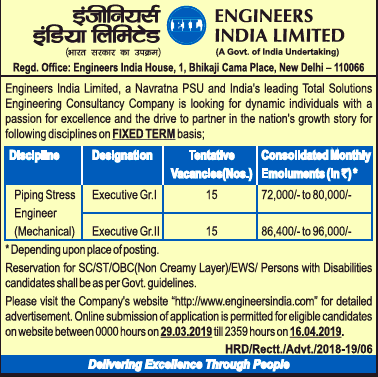 Engineers India Limited (EIL) is looking for dynamic individuals with a passion for excellence and the drive to partner in the nation’s growth story for the post of Executive Grade I and Grade II in Piping Stress Engineer Discipline on fixed term basis. The online registration process will be start from 29th March 2019 and will be close n 16th April 2019. For Detailed advertisement will be available soon. The online submission of application is permitted for eligible candidates on website between 00:00 Hours on 29/03/2019 till 23:59 on 16/04/2019.